Kam Chancellor forced a fumble that led to a Seattle TD and broke up New England’s final offensive play at the goal line to earn NFC Defensive Player of the Week honors. 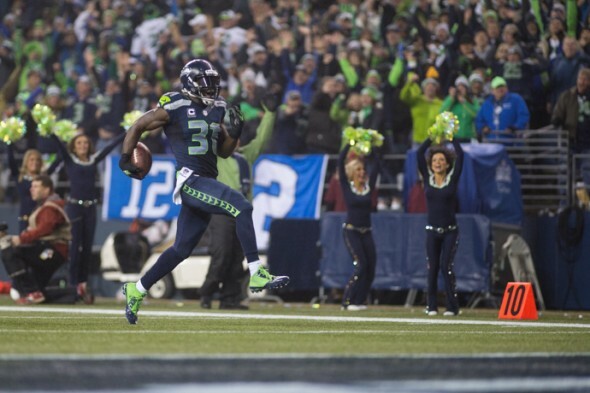 Seahawks safety Kam Chancellor Wednesday was named the NFC’s Defensive Player of the Week for his performance in Seattle’s 31-24 victory over the New England Patriots Sunday night in Foxborough, MA. This marks the third career Player of the Week honor for Chancellor, who had eight tackles (four solo) and made two key plays that directly influenced the outcome. Playing his first game since a groin injury a month earlier, Chancellor forced a fumble that led to a Seattle touchdown and then disrupted a fade route by Patriots TE Rob Gronkowski on fourth-and-one that iced the game for the Seahawks. Chancellor is the second Seahawk to nab a weekly award this season. Punter Jon Ryan was the NFC’s Special Teams Player of the Week following Seattle’s 27-17 win over the New York Jets in Week 4. Chancellor previously won the weekly honor for the fifth and 12th weeks of the 2014 season. Among Seahawks players, only CB Richard Sherman, with four, has more career weekly awards. The Seahawks (6-2-1) host the Philadelphia Eagles (5-4) at 1:25 p.m Sunday (CBS). Well deserved award! And welcome back, Bam Bam Kam!